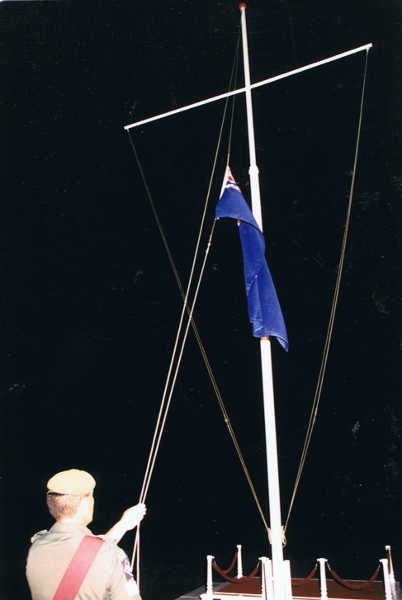 This photo was taken on July 20, 1989 at the closing ceremony for the home of the First Battalion, Royal New Zealand Infantry Regiment, at Dieppe Barracks in Sembawang, Singapore. The following month, in our own version of East of Suez, the battalion and its supporting force, began its relocation back to New Zealand, ending 32 years of continuous service in South East Asia. This whole tent is empty now. Chazray is gone and his buddies must be checking their emails in another tent. There were two more KIAs who were shot and so the internet was blacked out. One was shot in the chest and the other in the stomach. Very saddening. Families have been notified and so the internet is back on. It’s strange to see Chazray on the news and then look over at his empty cot and see his picture taped to the door. The video says he ran over the IED but he actually stepped on it but that doesn’t matter. All that matters is that he is missed by so many people. First prize must go to the Taliban which persists in stirring up trouble in Kabul. How hard is it to sit on your hands for a couple of years, tour the world, read a book and THEN take over the country once NATO and the US have packed up and gone home, secure in the knowledge that Afghanistan has worked…? The Tea Party are always Top Ten ‘Gump-ers’ and this example, albeit from Mother Jones, is a classic…let’s not build any more infrastructure because Al-Qaeda will just blow it up – this would be the same AQ that got lucky ONCE in the US, once in Madrid and struck out badly in the UK with attacks on physical infrastructure? If anyone doesn’t believe me—England and Spain. Now, if we have a more decentralized mass-transit system using buses, if the terrorists blow up a single bus, we can work around that. When they blow up a rail, that just brings the system to a grinding halt. So how much security are we going to have on this rail system, and how much will it cost? The al-Qaeda network is fully prepared to continue the jihad against the American infidels by launching deadly attacks, but your outdated and rusting transportation infrastructure needs to be completely overhauled for those strikes even to be noticed. We want to turn your bridges into rubble, but if we claimed credit for making them collapse, nobody would ever believe us. I cannot warn the US Army loud enough that this Soldier is unstable. They ignore my back channel warnings. Only a small percentage of US troops become murderers, but it happened here and it happened in Iraq. The warning signs were there. I have cautioned only twice about dangerous American soldiers. The first one committed suicide last year after my repeated warnings that he was dangerous. I told numerous key people that this soldier might want to kill me. He’s dead now. The second one is Master Sergeant CJ Grisham, now stationed and armed at Kandahar Airfield. Our military is playing with fire by keeping this man armed and in uniform. Let’s not forget that Mikey is currently embedded with a US unit in Afghanistan – and has been doing some good work – and so, you might think, would be less likely to snap at the hand currently (literally) feeding him…What’s CJ Grisham’s real sin? He dares criticise Saint Mikey…that’s it. Mikey, there is a big difference between someone fantasing about what they would like to do to you “I want to rip his head off and piss down his windpipe!”, threatening to do so…”I ‘m going to rip his head off and piss down his windpipe!”, and then actually acting on those words. One of these days, you’ll be a big kid and understand…in the meantime, try not to cry too much if you get disembedded again…or maybe even slapped with a libel suit yourself…I mean, you are after all abusing your position to make unsubstantiated allegations about a serving member of the force that is currently supporting you – how big do you think its sense of funny really is? It’s still very dark outside and the webcast from the COIN Center at Fort Leavenworth has just ended…the topic for discussion this morning related to principles identified in the RAND study Victory Has A Thousand Fathers and their application to FM 3-24, specifically from the perspective of what an updated FM 3-24 might include. The false prophets of Malaya who fail to truly understand that campaign and whom only glean the most superficial principles from it, namely a misapplied emphasis on ‘hearts and minds’, and who ignore the context in which that philosophy was applied and how it was applied. The COINdinsta who forget that FM 3-24 was a seminal, timely and truly useful publication – for the situation that the US faced in Iraq, in 2006 and 2006. It has limited applicability as writ for dogmatic application in other campaigns. The scope of the study is restricted to only 1978-2008, omitting the post-WW2 ‘golden age’ of counter-insurgency and many other critical campaigns of thus nature. While there would have been a need perhaps to keep the initial sample size to a manageable number, this arbitrary period omits a large proportion of relevant campaigns. The list of COIN campaigns 1978-2008 is somewhat limited: missing are any of the campaigns fought in Southern Africa in this period, as are those from the Middle East including Israel v Palestinians, and Iraq v Kurds; East Timor is not listed, nor is the campaign in Southern Thailand – while it is flawed in other ways, at least both of these campaigns appear in David Kilcullen’s The Accidental Guerrilla. Kiwis and Australians will be surprised to see that Papua New Guinea 1988-1998 which must be the Bougainville campaign is listed as ‘red’ i.e. a failure for the host nation government. The isalnd of Bougainville is still very much part of PNG and that the world has heard little from that part of the world since the withdrawal of the monitoring force in 2002, is more a testament to the effectiveness of that force 1998-2002. The principles for COIN derived from Victory Has A Thousand Fathers were on slides that I missed during the discussion (too slow with the screen grabs) so I’ll cover those in a couple of days once they are posted on the COIN Centre events page. What follows are some of the other insights from this morning. There is a case for the use of force in Irregular Warfare but first, let’s stop calling this COIN. As we know, COIN is a very specific and very narrow slice of the broader realm of IW: the continuing abuse of the term ‘COIN’ to describe operations in the contemporary operating environment unhelpfully muddies the waters. Specifically. these slides discuss the repressive use of force but we need to consider this just as much as we have to consider the other side of the pendulum that it’s all about being nice to everybody. One of the most refreshing things about FM 3-24 during our review of COIN doctrine in 2007-08 was that it acknowledged the need for use of force within a campaign, a most realistic diversion from other nations’ COIN doctrine which was based upon either experience in peace-support operations (whole different ballgame), super-localised internal issues (go Northern Ireland! ), or Malaya (myth city). If there was no potential for the application of force, then the military is not needed i.e. the military is not a cheap labour force, nor an easy substitute for the other government agencies and non-government organisations that should be there. While FM 3-24 does have a strong population-centric element, it was written for a specific campaign (Iraq) in a specific period (2005-6). That notwithstanding, the population-centric elements are well-balanced with other key principles and truisms for irregular warfare and I think that many critics only cherry-pick thos easpects they want in order to criticise and few if any consider the publication as a whole. In simple terms, it all comes down to national interests linked to campaign objectives and being able to measure the same; and at the tactical level, specifically, as recommended below, link development objectives to those campaign objectives and national objectives i.e. no more AID for its own sake. This just creates legacy dependency issues. As the US Army and USMC gear up to update FM 3-24, the time is ripe for some robust discussion on the content of its next iteration. Most definitely the sections of air and maritime power need to be expanded and updated. The forum for thoughts on this topic is at the COIN Centre Blog…. This week the air campaign in Kosovo is examined. The gradualist/risk strategy was employed despite its apparent discrediting in the Vietnam War. This led to a conflict between the commanders. General Short wished for the implementation of a punishment theory. It remains true that ground forces were not committed. However, was it the air campaign alone that achieved the favourable outcome or is there other factors? Was this a true convergence of ‘effects’ generated by the fortuitous or planned combination of offensive military action and the actions of a range of non-military players? The gradualist (graduated escalation?) strategy was discredited in Vietnam? The elements of strategy and tactics that were discredited in Vietnam (and other conflicts where the same has occurred) were those that were separated from the professionals in those fields and dictated largely by powerful but inexperienced (in warfare) politicians. Ground forces were not committed in Kosovo? So which famous armoured brigade crawled over narrow mountain roads into Kosovo? (Clue: its emblem is a rodent) Who raced the Russians for Pristina airport? Who’s still there now? While the air campaign may have helped set the scene for a relatively successful positive outcome to the Kosovo campaign, let’s not forget that the other instruments of the DIME (Diplomatic, Informational, Military, Economic) model were also decisively engaged in regional, domestic and international fora; and that these elements also deserve recognition for the roles they played in the campaign. It might actually be argued that Serbian land forces would have been more decisively engaged had a land campaign be conducted in the traditional manner. While the ability of the air component to engage Serbian land forces proved to be far more difficult than in the super-optimal environment of Kuwait and southern Iraq, and there is considerable evidence that a large number of targets engaged were ‘spoofs’. As events in the Falaise Gap (1944), Quang Tri province (1972) and the road to Basra (1991) showed, land forces in contact and on the move are significantly easier to engage with aerial fires. Given that the first Gulf War concluded with a notion of air power being capable of winning wars, how has the employment of air power since then challenged that assumption? This notion existed in a very few minds and if there is one single reason for air power’s lack of traction as an equal component of military power, it is the constant assumption of achievements that do not exist. Air power did not win the Kosovo campaign, Gulf War 1,or the Battle of Britain any more than my three-legged floppy-eared Spaniel. Not only do the domains operate together as part of the joint environment, there is no solely military solution to conflicts and these military options are employed as part of a whole of government inter-agency and broader comprehensive approach. The notion that dominated military thinking after DESERT STORM was that of the revolution in military affairs, the dreaded RMA, but not one in air power. DESERT STORM was the first conflict where information had been employed as a decisive tool. As it turned out as the 90s unfolded, much of the hype from that conflict was simply just that, hype; but at the time it had swayed the minds of the world to justify both the conflict and the methods by which it was conducted. While the application of air power may have influenced the withdrawal of Iraqi forces from Kuwait, that movement did not actually start until after the commencement of the ground war. This action offered an unacceptable threat to Iraqi land forces and forced the withdrawal, or maybe rout would be more accurate. While air power advocates may crow over the road to Basra, it is arguable whether that level of destruction was actually necessary or that it contributed anything meaningful to the conclusion of the conflict. For whatever reasons, air power was also unable to deter Iraqi repression of Shia in southern Iraq. Somalia. 1992-95 and current. Air used for ISR and mobility; a strong air bridge into Mogadishu during the former campaign. All decisive actions fought on the ground with air in support. Bosnia. Resolved by the deployment of a powerful US force prepared and empowered to play the warlords at their own game, meeting force with force. Primarily a land mission during the decisive post-Dayton phase with air in support. Rwanda. Air could have played a decisive supporting role here in 1994 by enabling the mass airlift of troops to reinforce the small UN force and reduce if not halt the genocide. Kosovo. See above: possibly a contributor to the scene setting before the deployment of land forces, however there are arguments that the air campaign was largely counter-productive and actually strengthened Serbian resolve. Bougainville. The 1997 deployment of peacekeepers (withdrawn in mission success in 2003) was supported by air for ISR, local mobility and maintenance of an air bridge for resupply and reinforcement. Solomon Islands. 2000, 2003, 2006-current. Land force deployment supported by air for ISR, local mobility and maintenance of an air bridge for resupply and reinforcement; air transport also employed during various NEO during these periods. East Timor. Major ground force deployment (division level) supported by air for ISR, local mobility and maintenance of an air bridge for resupply and reinforcement; kinetic air support also stood to during the lodgement phase in 1999. RNZAF Iroquois helicopters fly Australian troops in Dili, Timor-Leste. South Ossetia. Major, albeit one-sided land force on force confrontation between Russia and Georgia, with air in support (primarily on the Russian side after Day1) for ISR, strike, mobility and CAS. Chechnya. Primarily a land conflict between conventional Russian forces and irregular Chechan forces; significant air resources employed by Russia to no discernible positive value. Iraq. The primary effect of the no-fly zone campaign and its associated sporadic strikes into Iraq 1991-2002 was to keep the wounds between Iraq and the US open and festering. While the ‘shock and awe’ aspect of the opening of OIF was feted, the reality is that a decisive land campaign was always identified as the decider in this campaign, both the Plan A campaign to May 2003, and the insurgency to mid-2010. While ‘shock and awe’ can trace its roots through the Powell Doctrine of the 90s back to the ‘triumph’ of Gulf 1, the primary driver behind it was SECDEF Rumsfeld’s belief that greater reliance on technology would reduce defence costs by eliminating large numbers of expensive personnel. Afghanistan. Neither the British (between the wars) nor the Russians (1979-89) were able to quell local tribesmen by air. OEF was always predicated on a strong land campaign supported by air. The air bridge into Kabul in the earliest days of the campaign was a key enabler for early successes however air has remained in a supporting role to the land campaign. The mission to take down OBL was a land mission supported by air i.e. no UAV-delivered PGM through the window. Sierra Leone. Primarily a land-based peacekeeping operation. The British JPR mission in 2002(?) was a land force mission supported by air for mobility and CAS however use of kinetics was hindered by misperceptions of proportionality with the rules of engagement. Israel v Hizbollah. A classic example of how not to do it. Not only would any other aspect of the DIME model been better employed to counter HIzbollah rocket attacks into Israel from Gaza and Lebanon, but the use of air power as Israel’s tool of choice not only illustrated how behind the times Israeli military thinking was but also had the opposite effect to that desired, regionally and in the court of world opinion. Libya. The ultimate (so far) example of how not to employ air power. Not only has this meddling extended a minor internal conflict into one likely to drag on for years, but it has seriously damaged the credibility of air power as a decisive force and its advocates. Already some NATO nations are trickling land forces (under the guise of training and liaison) into Libya to attempt to recover the situation. This is what happens when you start to believe your own press.